I noticed a pretty unnerving problem recently. It was a normal day at work. I, being a blogger, spend a lot of time pounding on a little keyboard and staring at a big screen. While working on an especially stressful post and a particularly challenging paragraph, I started getting lightheaded. I'd stopped breathing. This was no medical emergency. I pulled my fingers off the keys, kicked back from my desk and took a gulp air. What was that about? I must've slipped a little too deeply into the zone. A head shake and a couple breaths later, and I was back at it. Within minutes, the same light-headed feeling was back. I'd stopped breathing, again! Did I always do this? Why can't I breathe right? It's, like, the first thing you learn how to do when you're born. Am I going to die? It turns out this is a thing. It's called "email apnea." According to one (very unscientific) estimate, about 80 percent of us do it. That includes you. 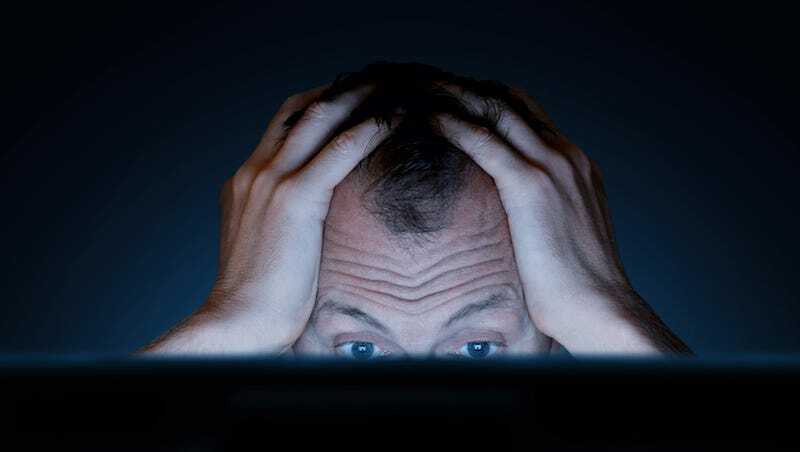 To quell any immediate anxiety this new diagnosis might cause, I should say that I think I've suffered from email apnea ever since my family bought our first Packard Bell desktop, and I'm a relatively healthy person. Email apnea also isn't really a medical condition, at least not one that a doctor will give you medicine for. It does have medical effects, though—so listen up. The term "email apnea" was coined in 2008 on the Huffington Post by Linda Stone, a former Apple executive who's done extensive work on the physiology of our relationship with technology. Like me, Stone noticed that she unconsciously held her breath while staring at a screen. She spoke to some doctors and, sure enough, holding your breath is pretty bad for you. From there, her blog post slides pretty quickly into pseudoscience, including an open-ended question about whether email apnea explains America's obesity problem. But why do we do it? I reached out to Stone, who's continued to research the phenomenon, and she offered a couple of hypotheses. Hypothesis number one: it's physical. If you've ever had HR walk you through how to make your desk space more ergonomically friendly, you'll know that most people have crap posture while sitting in front of a computer. "When our posture is compromised (arms forward, shoulders forward, chest caved in), it isn't even possible anatomically to breathe optimally," Stone told me. This isn't really science; it's common sense. Just try it: hunch your back and lean closer to the screen. Breathing is downright uncomfortable. Hypothesis number two: it's emotional. Email and computer activities are stressful—as is texting—and we don't breathe right when we're stressed out. Again, this sounds like common sense, but the effects are rather unsettling. And there's plenty of scientific research to back it up. A study last year by Gloria Mark and Stephen Voida from the University of California, Irvine, linked email use to common stress indicators like heart-rate variability. It turns out, when people are prevented from reading email, their heart rate varies less. This is actually a bad thing. "If your heart rate fluctuates 60 to 80 beats per minute, cardiac-wise that's healthier than someone whose heart rate varies between only 70 and 75 beats per minute," Dr. Fred Muench, who's studied the science of breathing extensively, explained to Men's Journal a few years ago. "It means your system is not so rigid. Someone like Lance Armstrong has a massive swing in heart-rate variability, whereas an unhealthy or older person has a much smaller one. The way to increase variability is to breathe slowly." The science there gets into the difference between the sympathetic and parasympathetic nervous system. While the sympathetic nervous system controls our stressful "fight or flight" mode, the parasympathetic regulates our relaxed "rest and digest" mode. Heart rate variability increases when you're in that "fight or flight" mode (read: stressed out) and this leads to all kinds of nasty side effects, like high blood pressure and your liver dumping glucose and cholesterol into your blood. That's why you feel worn out after sitting in front of a screen all day. Most of the time, you should be relying more on your parasympathetic nervous system. All that said, email apnea is not a medical condition. While it has medical effects, it actually falls into the broader category of ergonomics. The solution is simple: sit up straight and pay attention to your breathing. If you go to yoga, you'll be great at this. If you don't know how to breathe properly, try to Buteyko method. If you want to take things to the next level, you might consider investing in a health-monitoring system like the Heartmath EmWave 2 which watches your pulse and sends alerts to your computer based on your heart rate. Stone, pseudoscientist or otherwise, does have some good advice for how to avoid this tragic fate. "MOVE," she said. "Stand up. Make eye contact with others." It's good for you. Just like breathing.